During our 8-day long stay in Gaza, we met many wonderful people, and I will continue writing about them after I will have left Gaza. One young couple stuck out particularly, and not just because they are a beautiful couple, or because they are lovely and very interesting people to spend time with, or because they have been an incredible help to us by facilitating everything: from arranging airport transport between airport and hotel in Cairo, finding us a wonderful driver from Cairo to Rafah, arranging a driver here locally every time any of us needed one, supplying Antoine with cough syrup and magic honey-ginger soothing infusions, to getting David, Stephanie and us a flat after we moved out of the hotel. Since a majority of patients cannot get the medication they have been prescribed due to chronic shortages, Hani and Maya have launched a project aimed at international donors (pharmaceutical companies, medical representatives, doctors,…) to raise badly needed medicines. In fact, there is long standing and chronic shortage of essential medicines in Gaza. Here are some facts taken from a 2012 WHO report (World Health Organization): “While shortages of at least 10% of essential drugs have been reported by the MoH in West Bank and Gaza since the year 2000, during 2011 the MoH-Gaza reported average monthly zero stock levels of 32% of essential drugs and 22% of essential medical disposables throughout the year, indicating a crisis in provision of medical supplies. At the end of 2011, 148 of 480 essential drugs (31%) and 123 of 700 medical disposables (17.5%) were at zero stock in Gaza. In December, the MoH-Gaza appealed directly to WHO, the ICRC and other international organizations to intervene to solve the shortages problem. Four items — two powders and two solutions for decalcifying and disinfecting two types of hemodialysis machines — that are required to maintain treatment for 450 chronic kidney patients were at critical levels, sufficient only until January 7, 2012. Other drug items at zero stock included: 20% anti infective drugs, 13.5% chemotherapy drugs, 10% urology and kidney dialysis, 5.5% ophthalmological preparations, 7% psychotherapeutics, and 4% for cardiovascular.” See also this report from Médecins Sans Frontières. 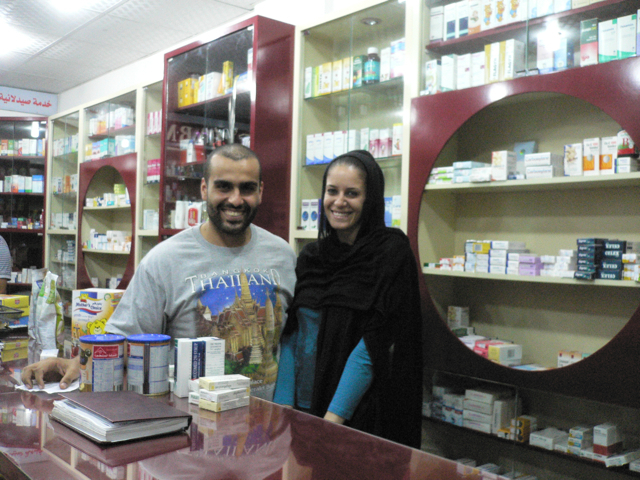 The medications raised through Hani and Maya’s outreach effort reach their pharmacy though the tunnels or are sent to (international) individuals in the West Bank who can then bring them in to Gaza. The pharmacy will donate them to (mainly poor) patients to whom this medication is otherwise inaccessible. Many of these are children with cancer, who cannot otherwise get the very expensive cancer drugs they are in need of! Please contact me if you can help with this and I will put you into contact with Hani and Maya. In another post (soon) I will write about meeting Hani’s uncle, Dr. Fouad M. El-Harazin, an engineer living in Chicago but regularly visiting and working in Gaza, another activist who has done a lot for the society in Gaza. This entry was posted in Visiting Gaza and tagged Gaza, international, political, shortage of medicines. Great stuff!!! Thumbs way up!!! Thank you Maire, I appreciated . You are also a wonderful couples with Antoine . Inshallah next time You will come and Palestine will be free that we can move freely without Planes and borders. me and Maya will do our best to help the People who are in need. and for sure with your help we can do it . Of course Netanyahu’s hasbara machinery produces scenes of stores where shelves are abundantly stocked to refute any humanitarian crisis but they never discuss the facts on the ground such as human mobility, daily power outages that interfere in the lives of Palestinians of Gaza but especially in hospital operating theatres, the critical shortage of medicines, and the cost of potable water (http://www.unicef.org/infobycountry/oPt_39197.html). But according to Netanyahu, there is NO humanitarian crisis in Gaza! In the last days of our visit I became painfully aware of how neigbourhood markets are stocked full of chips, chocolate bars and cakes, and of course sugary sodas. In the evenings you cannot escape the scenes of children playing outside these markets (probably because they always have electricity (supplied by generators) during the outages. No no, there is no humanitarian crisis in Gaza…look they have all the chips and chocolate they could possibly want!! But what of their quality of life? What, now you want quality of life too? Your just asking for too much. Fortunately there are people like Hani and Maya who focus on what is important; providing services that respond to what the Palestinians of Gaza really need.